It's Fall Spirit Week at SDMHS! Advisories are decorating doors throughout the school and homerooms are competing in a dress-up day contest to see which class has the most school spirit! 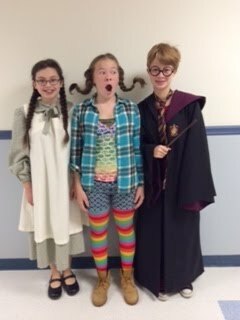 Monday was fall colors day, Tuesday was twin day; on Wednesday storybook characters roamed the hall (including 7th grade versions of Laura Ingalls Wilder, Pippi Longstocking and Harry Potter, pictured here). Thursday was mismatched day and Friday, of course will be Blue and White Viking Pride day. Winners of the contest will be announced at lunch on Friday.